Whenever I go to Chennai I will get a big bunch of Thonnai (Cups made out of dried leaves). I use them for steaming idly’s, paruppu usli etc. They give a nice flavor to the dish. 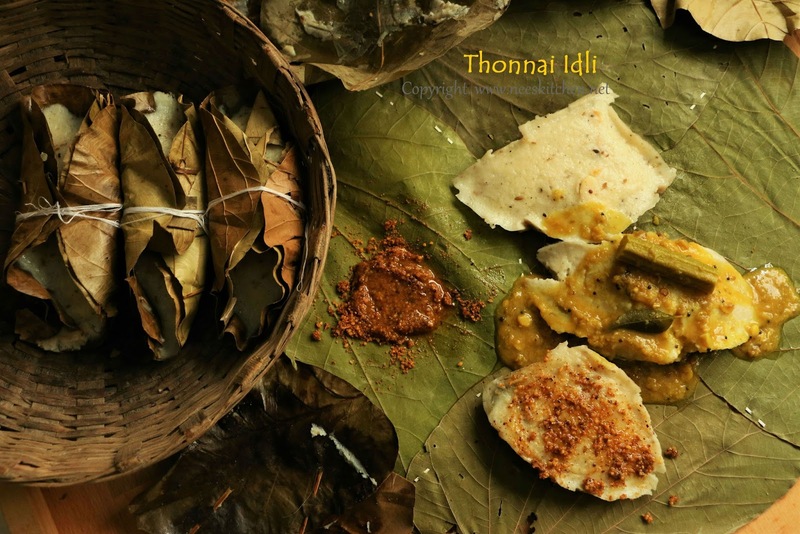 One such dish I make is the thonnai idli . Temper you regular idli batter with ghee, gingelly oil, mustard, pepper, cumin seeds, cashew’s, Bengal gram & urad dhal, curry leaves. Ferment it overnight , pour them in your thonnai to steam for 15 minutes and finally tie them as a packet for a minimum of 30 minutes to get this flavorful thonnai idli. I just use my regular idli proportions and temper them with spices which are almost similar to Kachipuram idly. 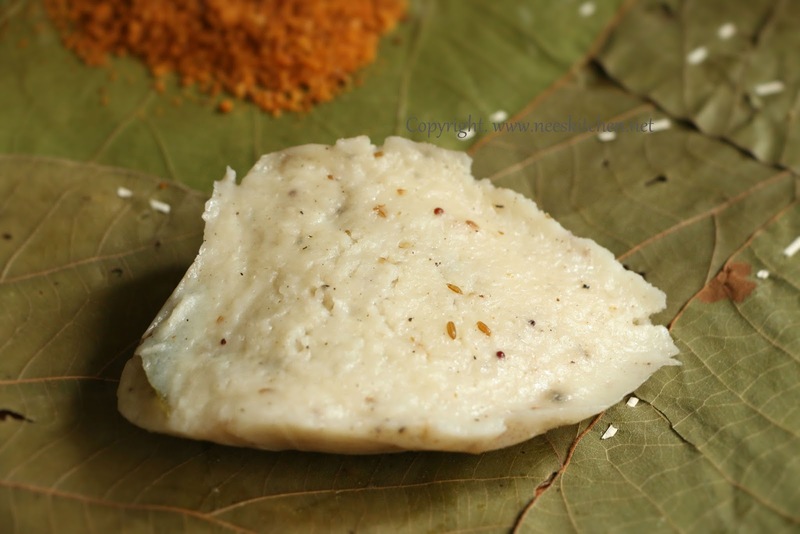 I don’t use sukku powder which is a must in Kanchipuram idly as I don’t have with them. Hence I replace it with fresh ginger. After steaming leave I leave it for five minutes before tying them with a thick thread, this is because they are too hot to touch. Once I tie I put them in a hot pack and take out before serving. A minimum of 30 minutes will give a good flavor and more the time is better. It tastes more good if you apply molagapodi and them tie them. I have not taken the pictures of idly batter steps as you may use your regular idli batter consistency. This is quite easy when we pack it in our lunch box the smell and softness is naturally preserved. 2. Grind them slightly coarse than regular idly batter. 3. Take a mixer and grind cumin seeds & pepper into a coarse consistency. 4. Take a small kadai or fry pan and add ghee and gingelly oil. 5. Once heated add hing and mustard and let it splutter. 6. Add urad dhal, Bengal gram, ginger, cashew, cumin & pepper powder and curry leaves and let it get cooked. 7. Mix it with the idly batter. 8. Let this ferment for 6 -8 hours or overnight. 9. Make sure the thonnai is cleaned with a wet cloth. No oil needed to be applied. 10. Once fermented, pour it into the 3/4th of Thonnai. 11. Arrange them in a pan which can fit into pressure cooker or idly pan. Make sure they are tightly arranged one next to each other. If they are loosely arranged the thonnai will open up easily. 12. Steam for 20 mins. 13. Take out and let it cool for just 5 minutes. 14. Take a thick thread and tie them joining the edges of thonnai. 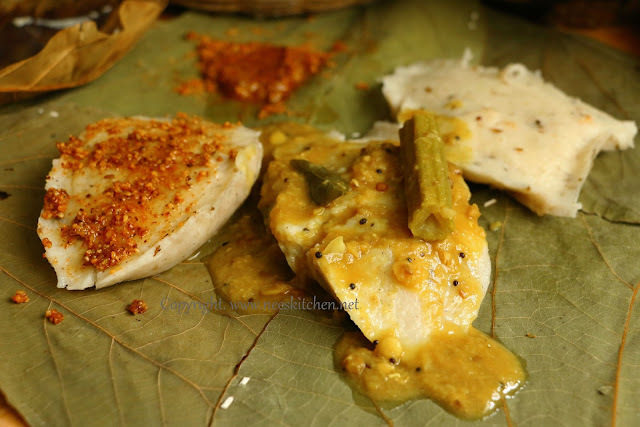 This step is optional but if would give a good flavor to the idly. Prefer to keep a minimum of 30 minutes inside a hot pack. 15. Before serving take out the idly from the leaf. It comes out very easily. 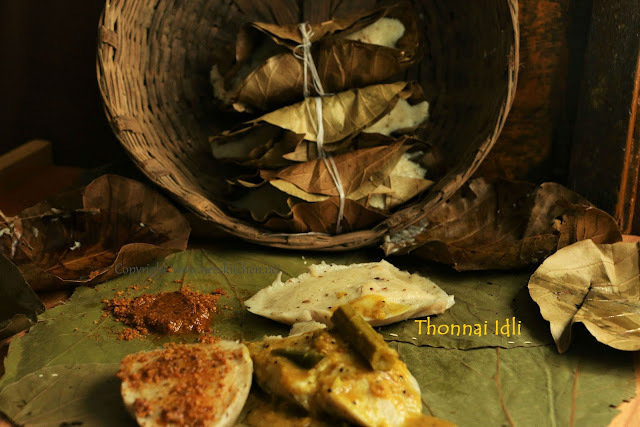 Make sure the idly’s batter in thonnai are kept next to each other tightly packed in the cooking vessal. You may use your regular idly batter proportions. Check if Thonnai has any holes before putting the batter. Consolation prize in Better Butter "Lunch box Ideas Contest.